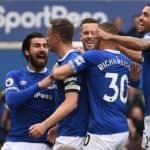 Gerard Deulofeu´s late equaliser, four minutes after Mesut Ã–zil had put Arsenal ahead, earned Everton a well deserved point in an entertaining match at the Emirates Stadium. 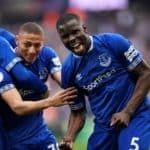 Everton buoyed by their midweek victory over Man Utd at Old Trafford, produced another impressive performance, but it was the hosts who looked set to secure the three points when Ã–zil opening the scoring in the 80th minute. But, just four minutes later, and with just six minutes remaining, Arsenal´s tedious chant of ´1-0 to the Arsenal´ was promptly silenced by Deulofeu, when the 19-year-old smashed past Wojciech Szczesny less than five minutes after coming on as a substitute.